The worldwide leader of fusion splicer technology, Fujikura, will attend LASER World of PHOTONICS in Munich this month to showcase its latest splicing technology, including the new fibre recoater series and the new fibre cleavers. The new line of large diameter optical fibre cleavers (CT-105/CT-106) offer high precision LDF capability – applicable from 80 up to 1,250 μm diameter fibres, and cleaving to a precision that tops anything available on the market. The CT-106 is able to perform both flat and angled cleaving. The cleavers provide advanced cleaving solutions for end-users in fibre laser, medical and optical fibre sensor applications. The launch of the new line of high-precision LDF cleavers has extended Fujikura’s solutions in LDF fibre splicing and glass processing preparation. This complimentary equipment to the Fujikura ARCMaster™ fusion splicers (FSM-100 series) and LAZERMaster™, CO2 laser splicer (LZM-100) continues to support customers in their fibre operation. Also being showcased at Laser World are Fujikura’s new optical fibre recoaters (FSR-05/FSR-06/FSR-07) that provide advanced recoating solutions for applications in fibre laser, fibre sensing, submarine and optical components. Each fibre recoater is engineered to specific processes, providing flexibility to determine features needed. All fibre recoaters feature automatic and easy operation as well as easy mould and recoat material exchange. The FSR Series is the latest addition to enhance Fujikura’s ARCMaster™ product line which includes the laser splicing system, specialty fusion splicers, cleavers, strippers and other accessories, all of these will be on display at Laser World. Fujikura recently celebrated its 120 year anniversary and remains one of the world’s leading manufacturers of communication and electronics products. Fujikura Europe’s team will be at the event to demonstrate the high-quality products and answer any questions. Visitors can find Fujikura Europe in Hall A3, Booth 218. The LDF cleavers provide advanced capabilities including extensive programmable features to ensure optimal and consistent results. Such features include: a programmable automatic clamp function, an angle cleaving function (only CT-106), storage for up to 100 program modes, a blade life of 20,000 cleaves with a cladding diameter of 125 μm and a colour LCD monitor. Applicable optical fibres include not only solid glass optical fibres, but also microstructured fibres and capillaries. The recoaters feature easy-to-exchange moulds. All recoaters consist of a programmable resin injection quantity and coloured and non-coloured fibre recoating capability. The FSR-06 and FSR-07 recoaters include proof testers to test the strength of fibre after recoating while the FSR-05 recoater is the only model without a proof tester and is ideal for manufacturers that don’t require constant proof testing after each recoat. Fujikura’s splicing and glass processing system includes a CO2 laser heat source for splicing and glass shaping with tremendous capability for R&D and production. The clean heat source provides extremely stable and repeatable operation with virtually no maintenance and provides excellent performance for dissimilar diameter fibre splicing. The advanced configurable system provides ultra high-strength splicing for fibres with up to 2.3 mm diameter, and is easily adaptable to meet specific customer needs. It includes a customisable chassis and mechanical architecture to tailor laser beam size, shape and power and is capable of producing tapers, ball lenses, combiners, MFA’s, glass shaping and splicing. 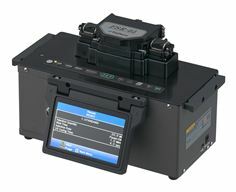 The user interface also has compatibility for FSM-100series arc fusion splicer, which are most common machine for the special fibre splicing.